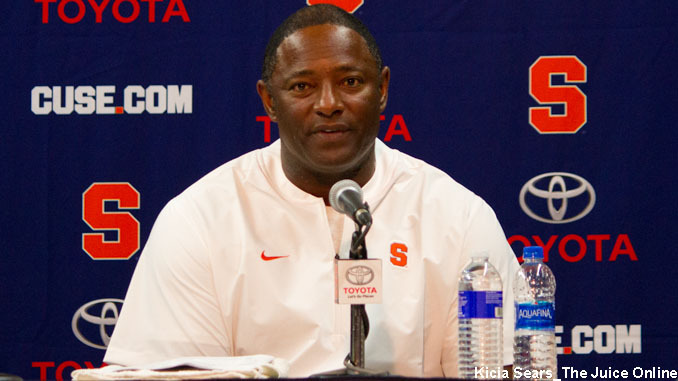 Syracuse coach Dino Babers speaks with reporters. Mandatory Photo Credit: Kicia Sears, The Juice Online. As a result, Airon Servais and Evan Adams were the only two projected starting offensive linemen to play on Saturday. Servais started all of 2018 at center but is expected to shift to guard, while Adams is locked in as the team’s starting right guard. Ryan Alexander, a graduate transfer from South Alabama, is expected to round out the starters on the offensive line at the other tackle, but he won’t arrive until summer. In their places, Syracuse played a cadre of inexperienced linemen, which included true freshman Anthony Red and redshirt freshman Carlos Vettorello at tackles and redshirt sophomore walk-on Austin Chandler playing left guard. Well, you have your pick among three primary contenders. Michigan State transfer Trishton Jackson flashed his hands, hauling down a ridiculous one-handed catch while dragging his feet on the right sideline for a touchdown. Shortly after, redshirt freshman Anthony Queeley made his case, leaping over walk-on defensive back John Sweetwood to snare a pass over his back-shoulder for a touchdown as the Carrier Dome crowd went crazy. If pure ground game speed is more your cup of tea, true freshman Jawhar Jordan flashed his offensive potential, burning the defense for a pair of touchdown runs (though the second run was called back for a hold). He finished with five carries for 56 yards, 47 of them coming on that one play where he shook one defender and then turned on the jets to beat the rest of the defense in a footrace to the endzone. While much of the attention has been focused on the offense, there were plenty of defensive plays, as well. Alton Robinson looked every bit the player that became an All-ACC Second Team selection, collecting a sack and also forcing a fumble that was returned for a 57-yard touchdown from safety Andre Cisco. As mentioned, Williams recorded a pick-six on the opening drive. Williams will be particularly important to the Orange’s defense this season, since SU for the second straight season lacks depth at the linebacker position. Syracuse played in several 4-2-5 sets last season with Kielan Whitner and Ryan Guthrie as its primary linebackers. While both were question marks heading into the 2018 season, both Whitner and Guthrie were key cogs of the defense by the end of the year, and Guthrie ended up being an All-ACC Second Team selection. If Syracuse stays in 4-2-5, which makes sense given the depth in the secondary, Williams will be counted on to help stop the run in early nickel downs. On Saturday, we saw Andrew Armstrong and Lakiem Williams starting, but this is the one position where the starting positions are truly up for grabs. Among other names to keep an eye on include Tyrell Richards and Juan Wallace, along with true freshmen and four-star recruits Mikel Jones and Lee Kpogba. It was a star-studded Saturday, with the legendary 1966 backfield of Larry Csonka, Tom Coughlin and Floyd Little on hand. The trio met with the team prior to the scrimmage, and also signed autographs and took pictures with fans. Csonka and Little went on to have Hall of Fame careers in the NFL, while Coughlin should warrant strong consideration for the Hall of Fame. Coughlin coached the New York Giants to wins in Super Bowls XLII and XLVI.